On 12th November 1928, William Naismith a 19 year old bricklayer residing at Mayfair, Station Road, Blantyre was fined £5 at Hamilton Sheriff Court for driving a motorcycle in a dangerous manner through Blantyre Streets. The motorcycle was similar to the one pictured, a powerful machine by the standards of the day. Had this accident happened these days, the man would surely have been tested for alcohol. Not so common those days and this whole sorry saga unfortunately does sound like a drunken driver accident. The first breathalyzer in the UK wasn’t introduced until 1967, but other less reliable tests were conducted on drivers for a couple of decades prior to this. Hi Paul, I posted a comment at the end of this article. Kindly keep all these articles coming, I love reading them all – I am learning so much. Regards to you and Paula. Mike. Not to be funny, but the article says that he had a pillion passenger with him. 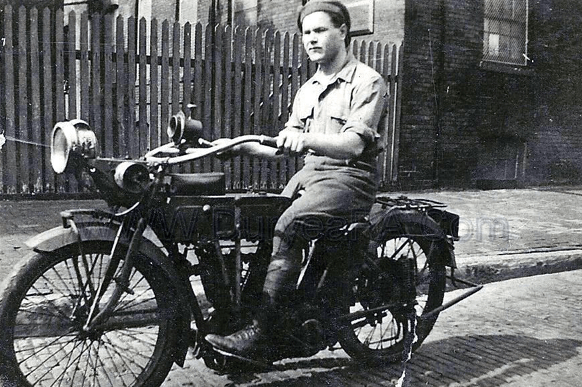 Would this mean that the motorcycle had a side-car, similar to what the German soldiers rode in World War 2? Just wondering, since we Americans do not use the word pillion, as far as I know. Thank you.